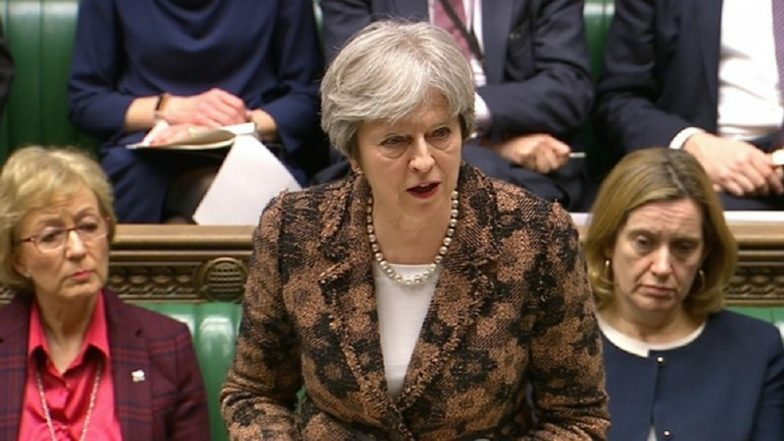 London, March 29: For the 3rd consecutive time in a row, the deal to facilitate Brexit or the exit of Britain from the European Union - tabled by UK Prime Minister Theresa May - has been defeated in the House of Commons. The British MPs, including those from the ruling Tories, have voted against the proposed legislation. Although the margin with which May's Bill was defeated has gone down as compared to the last time when the Parliament went to vote, the majority of the lawmakers have voted against the law. According to news agency AFP, the negotiation deal was defeated by 344 votes against it, as compared to 286 votes in favour. Brexit Crisis: Will Theresa May Step Down? With her proposed Bill being defeated for the third time, pressure has mounted on May to step down. MPs of the Conservative Party, including members of the Cabinet, are reportedly in favour to elect a new leader to bring Britain out of the impasse. Downing Street has, however, ruled out such a plot, claiming that the government stands behind Theresa May to resolve the Brexit deadlock. UK Chancellor Philip Hammond said it would be unfair to put the onus on May for not being able to end the impasse. "This is not about the Prime Minister…changing Prime Ministers wouldn't help, changing the party of government wouldn't help," he had said. With the Brexit deal being defeated again in the House, the United Kingdom has one of the following three options: exiting the EU without a deal, agreeing to a Canada-style free-market pact, or holding another referendum to decide on whether the UK should leave the European Union. On a "second Brexit referendum", Hammond said it is an alternative which should be explored by the lawmakers. "It is a coherent proposition and deserves to be considered, along with the other proposals," the senior Cabinet minister had said.